Introducing our first ever “In The Streets” segment! In The Streets focuses on pictures our clients give us of our dumpsters in action on their job site. 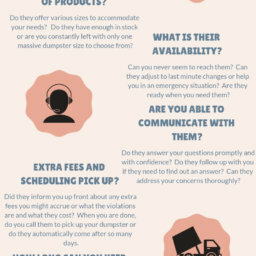 Seeing what our clients need a dumpster rental for helps us to fine tune our customer service even further. Plus, we LOVE to hear how the projects are going so be sure to keep us updated! This week’s highlight comes from a dumpster rental in Burr Ridge, Illinois courtesy of our client, Frank Childress. Frank sent us this photo from a construction job site where he and his coworkers were diligently assembling a new structure that will someday be filled with laughter, love and great memories. Frank had used our dumpster to store some building material and, later, filled it with debris that our staff hauled away as soon as he gave us a ring. Glad we could be of service! Thanks for the photo, Frank! If you would like to submit a photo for your chance to be featured in “In The Streets” please leave a comment below or use our contact form to reach us. 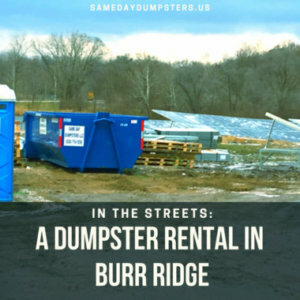 When you are ready to use a dumpster for your next home project or commercial gig, give Burr Ridge Dumpster Rental a shout! Only can thick-skinned Chicago residents take on the extreme temperatures of Polar Vortex 2019 and laugh about it.